The original Kickboxer is no masterpiece. The film is good, but it was never destined to be anything more than that. The filmmakers wanted to entertain the martial arts film fan and the film delivers what it promises. 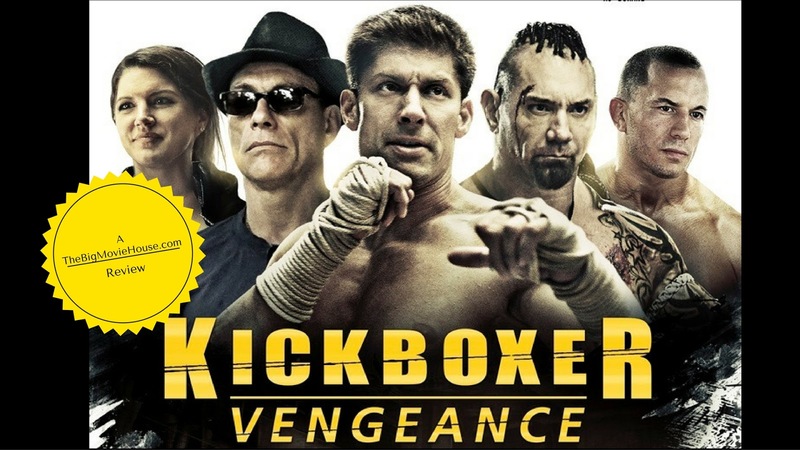 Kickboxer: Vengance, a reboot/remake, tries a bit too hard at times to make up for the lack of story. The film is told out of order, beginning with Kurt Sloan (Alain Moussi) attempting to kill Tong Po for the death of his brother Eric (the late Darren Shahlavi). After this is revealed the film jumps to three months earlier. We find the brothers inside of a gym that they work at celebrating something, maybe a birthday or a win for Eric. I can’t remember what they are celebrating, all I know is there were a lot of people there and cake was involved. Anyways, a woman by the name of Marcia (Gina Carano) shows up and offers Eric a ton of money if he will agree to train and fight in underground fights in Thailand. The brothers argue about it for a few minutes and then Eric agrees to go. Months pass, then one day Kurt gets a package from his brother saying that he has a fight coming up against a man by the name of Tong Po (David Bautista) and Eric wants Kurt there. Then there is something about Eric being in the Olympics because in the same package there is what looks like an Olympic medal, but it is never talked about before or since this one time. Eric goes to Thailand to watch his brother fight, but it turns out that Tong Po is really, really good and he is also a killer. As the police raid this illegal underground fight, Tong Po snaps Eric’s neck and then casually leaves the place. I know that this scene is supposed to be emotional, but the casualness of the whole thing made me laugh. Kurt wants revenge and he hires Eric’s Thailand trainer, a man named Durand, played by Jean Claude Van Damme. Van Damme’s inclusion here is why I say that the film is a reboot. Van Damme played Kurt in the original Kickboxer and here he is the Master. It would be cool to see these two worlds combine in order to see young, lates 1980’s Van Damme train under older, 2015 Van Damme. It was a thought that ran through my head during the whole film. It should be pointed out that, except for a few things here and there, this film is pretty faithful to the original. You have the two brothers, the older brother goes to Thailand to fight Tong Po, the older brother dies, and then the younger brother trains to fight Tong Po. The training sequences are pretty close too. In the original, Van Damme knew he was ready to take on Tong Po when he chopped down a tree with his leg. The same happens in this film, although the three here is much smaller, proving that the 80’s could take on the twenty-teens and win. The 80s were a tougher time. This film also has a larger budget. The original cost a few million dollars, whereas this film cost $17 million, probably because of the bigger cast. The film does look nice and has plenty of fight scenes so you can kind of tell where the money went. If there is one thing to complain about it would be the camera work. The camera never sits still. It is always moving even in a scene where you don’t think its moving, it is. The film was directed by John Stockwell who has given us Blue Crush (2002), Into the Blue (2005) and Seal Team Six: The Raid on Osama Bin Laden (2012). He has never directed a full on martial arts film before so I guess that he can be forgiven a little bit, but I just wish that the camera would have stayed still just for a scene or two. There is also an issue with the editing. Whenever there is action on screen, it seems that the editor wanted to make people sick by having a lot of fast cuts thereby making the fight scenes look a lot more brutal than they really are. This is a technique that has been plaguing martial arts films for decades. I like a lot of Stockwell’s films but I wish that he had sat down and watched some martial arts films from Hong Kong and even the Raid films. The Raid films especially as they were directed by a man who knew how to stage fight scenes. Sure, the camera moves a lot in those films too, but there is a beauty in those films that is missing here. There is one more thing to mention and that is Van Damme’s voice. Throughout the film it sounds that some of his lines have been dubbed over. This is not something that is out of the ordinary. A lot of times actors have to come into the studio and do ADR (Automatic Dialogue Replacement). This is because the sound was recorded properly or something was off with the way a line was said. Many different reasons can cause ADR to be used. Here it sounds like someone else is doing the dubbing. Van Damme’s fairly thick accent disappears or becomes muted, like someone is trying to do Van Damme’s voice so that no one will notice. It could be nothing, but I thought that I would point it out anyway. Kickboxer: Vengeance is a good film. The acting is pretty decent and the fight scenes are good, but could have been better if the damn camera would stop moving. The film is definitely worth a watch, as it is one of the better martial arts films I have seen in a while.